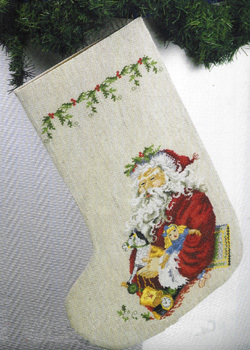 A jolly Santa with lots of toys for girls and boys on a Christmas stocking. This would make an attractive Christmas decoration for years to come. The large scale chart is printed over two A3 pages and uses cross stitch and backstitch in 24 shades of stranded cottons. There is also a template to aid in cutting out the finished embroidery. a needle, brass ring and instructions.